iPhone backup encryption is essential for security purposes. When you encrypt your iPhone backup, it is protected with a password. If for some reason you want to change the iPhone backup encryption password, you need to provide the old password first. And if you forgot the original password, then it is impossible to change iPhone backup password. Fortunately, there are solutions available. Like what I said before, if you don't remember the original password, then changing the iPhone backup password is impossible. So, you need to find your old password first. There are a lot of tools that can help you in this regard. KeyGenius iPhone Backup Unlocker is one of them. 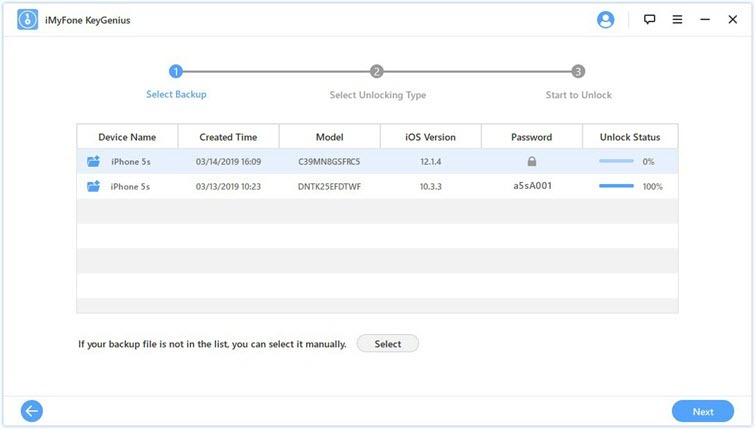 KeyGenius iPhone Backup Unlocker is a powerful iPhone backup unlocking tool that has been designed to help iOS users find iPhone backup password conveniently. The tool is ideal for decoding iPhone/iTunes backup password in wide variety of scenarios. Uses various advanced and powerful algorithms to decode the backup password safely and conveniently. 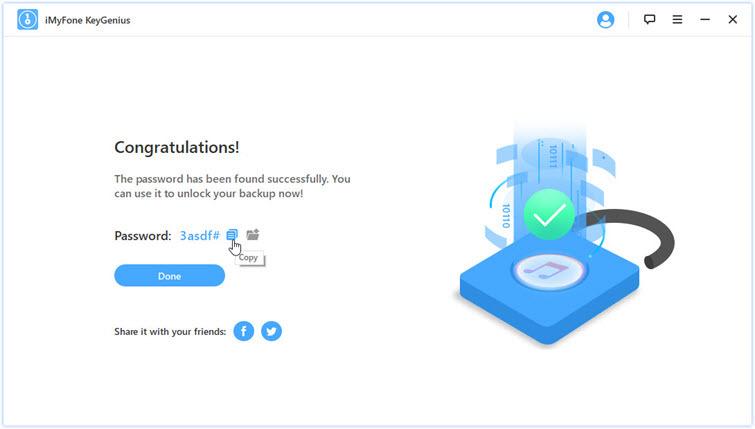 Differs from other similar tools because it doesn't do any damage to your backup data during the backup password decoding process. Very high password decoding success rate when comparing with other similar tools. You can pause the decoding process and resume it at any time. Fully compatible with all latest versions of iOS devices and iTunes. Here are the two steps to enable you change iTunes backup password without the original password. 1. Launch iMyFone KeyGenius on your computer. 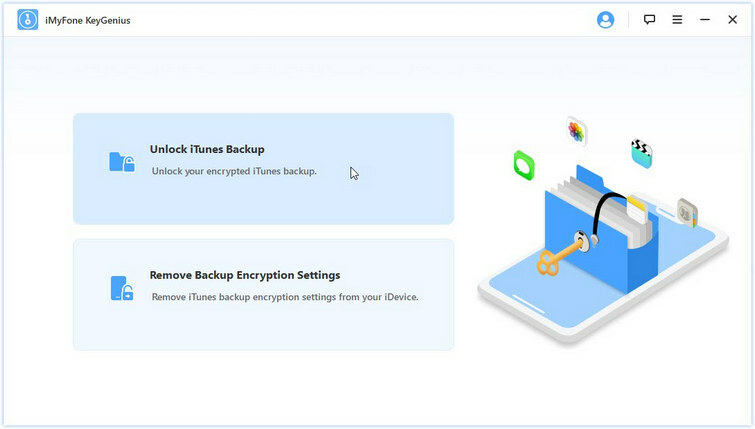 On the software's home screen, click on Unlock iTunes Backup. 2. 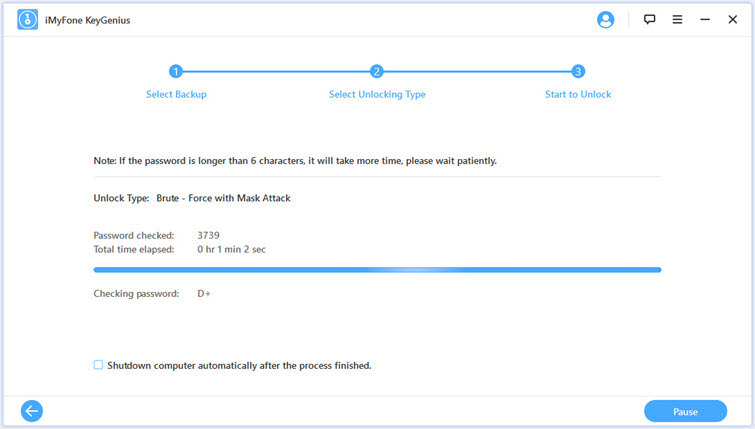 Next, select the encrypted backup from the list shown on the screen and click on the Next button. 3. 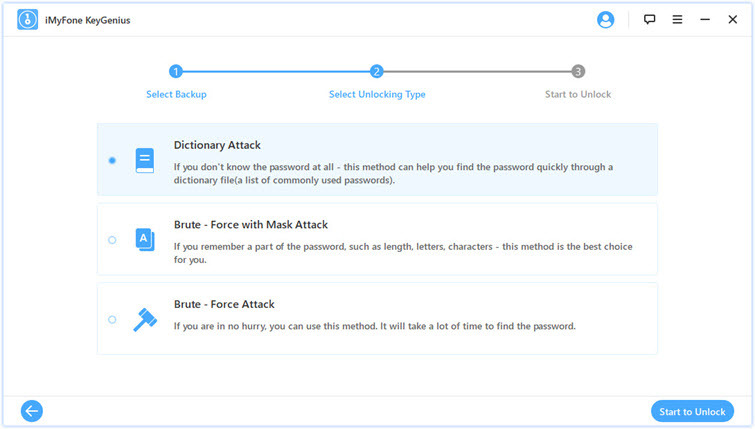 Now from the list of modes, choose Brute - Force with Mask Attack and click the Start to Unlock button. Once the process is complete, you will see the iPhone backup password on the screen. Launch iTunes on your PC. And connect your iPhone to your PC with a compatible USB cable. On iTunes, navigate to Summary > Change Password. Now input your old iPhone backup password and then set your new password. Once you have set the new password, click on Change Password to confirm your action. The above method is available for all versions of iTunes and iOS and makes changing password for iPhone backup as simple as possible. 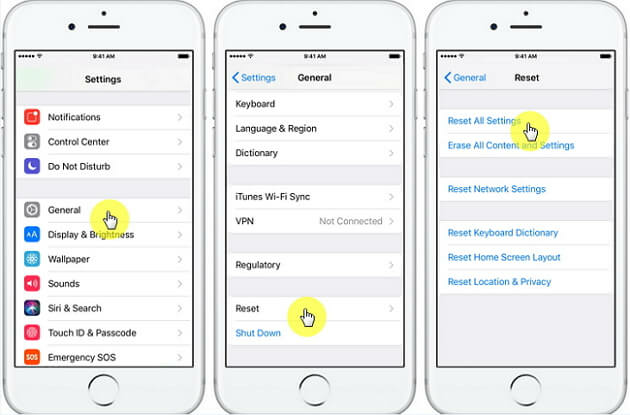 You can also reset the iPhone backup password by resetting your device. Keep in mind that this will only allow you to create new encrypted backups without password. You still won't be able to use your encrypted backups. Navigate to General > Reset and tap on Reset All Settings option. Now input your iOS passcode to confirm your action. After resetting, you can launch iTunes and set new iTunes backup password. You will lose all settings on your iPhone. Including all your passwords, fingerprint, App settings, wallpaper, ringtones, etc. Note: This solution only works on devices running iOS 11 and above. 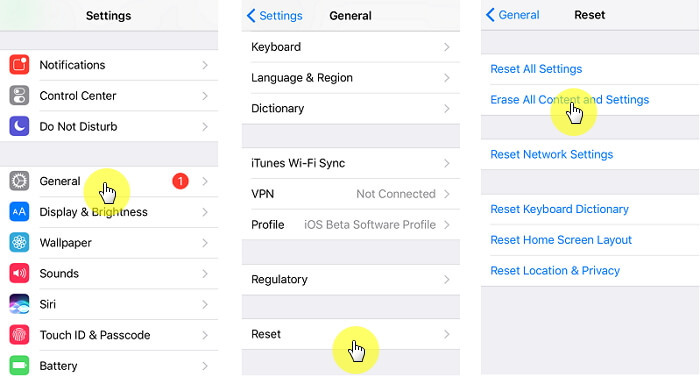 For older devices running iOS 10 and earlier, you will need to completely reset the device. Read below. Navigate to General > Reset and tap on Erase All Content and Settings option. Now input your iOS passcode to confirm your action. After resetting, you can launch iTunes and set new iTunes backup password. 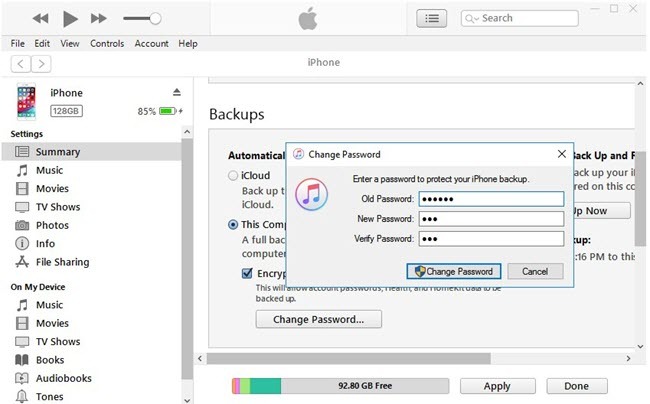 After resetting, you'll be able to change your iPhone backup password by creating a new one. You will lose all data on your iDevice. Changing iPhone backup password can be a hassle when you forget the original password. Fortunately, there are ways to help you change it. You can use iMyFone KeyGenius to find the iPhone backup password and then set new password via iTunes. Apart from this, you can also reset the iPhone backup password by resetting all settings (iOS 11 and later) or fully resetting the device (iOS 10 and earlier). But you'll lose your important data.